I am out west for my holiday break now, but this post was written and scheduled on Monday. By now most of the animals I enjoyed observing in September and October are dead, dormant, or gone south. When I do run into signs that a creature has been out and about, it’s always worth stopping to take a look. 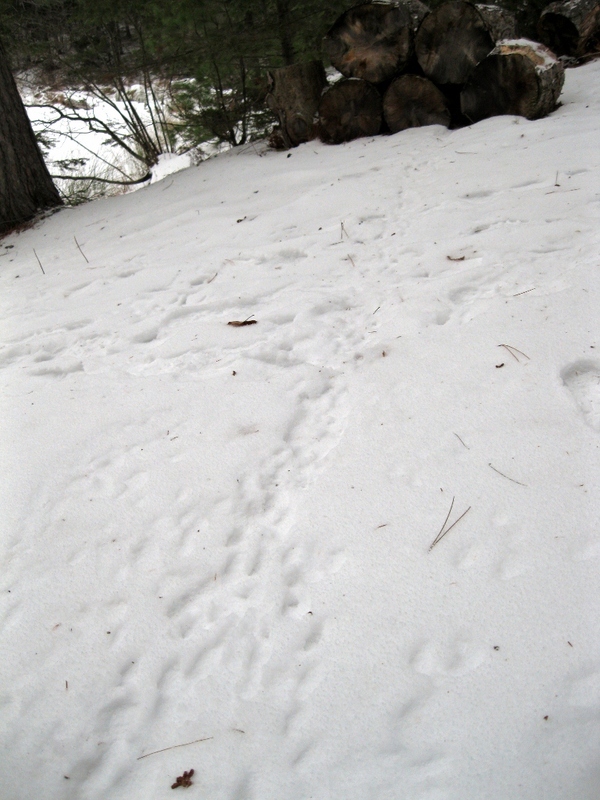 Running vertically from the bottom of this photo to the woodpile at the top is a well-trod squirrel highway, crossed at right-angles by human boot prints. When I looked more closely I found the remains of a meal of pine seeds on top of one of the logs. 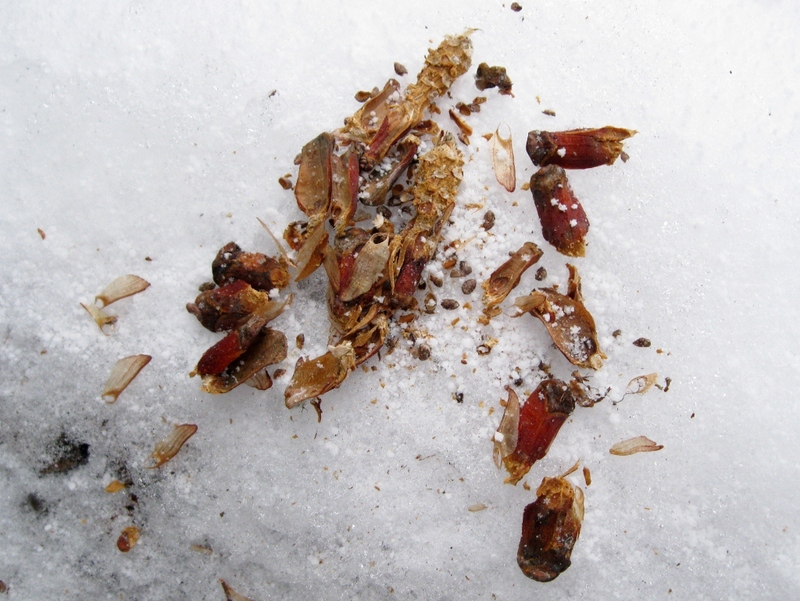 In the video you can see the squirrel disappear under a pile of decaying logs and emerge with a cone. It did this several times while I watched, so I assume I stumbled upon it retrieving food from a cache. I was tempted to lift up one of the logs and see what all was in there, but I decided I didn’t want to disturb it, in case doing so would adversely affect the squirrel’s survival somehow – the animals that do remain active through the winter here need every scrap of calorie they can get. Tomorrow is the winter solstice. Halfway out of the dark, my friends. Oh how timely…I was thinking of writing to ask you about a squirrel I saw. It was on the drive back from Jekyll–I swear I saw a black squirrel on the side of the highway somewhere between Brunswick and Savannah. Is such a thing likely? It sure moved like a squirrel, but the only colony of black squirrels I’m familiar with in this country is around Kent State. There are black squirrels where I live in Wisconsin as well. They’re just a color morph of gray squirrels, so I suppose you could have a few black squirrels anywhere you have gray squirrels, though they’re certainly more common some places than others. Love the video! once in awhile we see a white squirrel here in Missouri–albino or leucistic grey squirrels. Merry Christmas and Happy New Year, Rebecca! I so enjoy your blog! Half way out of the dark, indeed! Hope you have been having a great vacation. I look forward to more of your great posts in 2012!